Notes | See them at their best moments of leadership, pulling the ball out of the sky, charging through a tenacious d-line, eluding a tackle, appreciating the fans, or simply clowning around. These are not the Bengals of old; these are the Bengals of Coach Marvin Lewis, a team of great players who possess even greater character. And here is the photo book to prove it. The road back for the Bengals includes the loss of old star players but also the emergence and acquisition of young talent that came to the team simply to be a part of the resurrection. 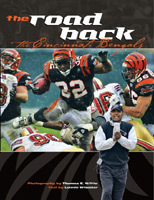 From the grace of Jon Kitna, to the stoic leadership of Carson Palmer, and the zany touchdown clebrations of the uncoverable Chad Johnson, Marvin Lewis and his staff took a team that had been trained to lose and taught them how to win. Comments | [09/27/06] Yes, I live in the same city as Thomas, yes we worked together a time or two a few years ago, yes we both drink Guinness. That doesn't mean his book doesn't rock. Talk about a flying short course...... Thomas has worked hard to cull down thousands of images to a few hundred to go in this book. The work and effort shows. Each image has excellent impact and tells the story of the Bengals since Marvin Lewis has taken over the reins. I have studied this book like a college textbook looking carefully at each image to understand why it was taken and to learn what a real professional photographer's thought process is. I was not disappointed. This is a bargain at the Sportsshooter price of twenty bucks. Comments | [09/18/06] Living in D.C., I don't fancy myself a Bengals fan. I am a fan however, of Thomas Witte, and if you're not, this will certainly convert you. The quality of the pages and print make the images pop right off of the page. At the very least I recommend you pick up a copy of The Road Back as a "how-to" for shooting football. It shows how compelling images can be made both before and after the whistle is blown. This book keeps finding it's way to the top of the stack on my coffee table, two thumbs up !